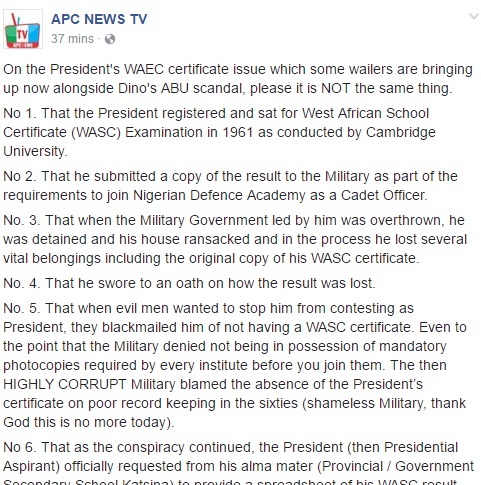 According to APC NEWS TV, President Buhari sat for the WAEC Exam in 1961, but he lost his certificate when he was overthrown as Head of state. On the President’s WAEC certificate issue which some wailers are bringing up now alongside Dino’s ABU scandal, please it is NOT the same thing. No 1. That the President registered and sat for West African School Certificate (WASC) Examination in 1961 as conducted by Cambridge University. No 2. That he submitted a copy of the result to the Military as part of the requirements to join Nigerian Defence Academy as a Cadet Officer. No. 3. That when the Military Government led by him was overthrown, he was detained and his house ransacked and in the process he lost several vital belongings including the original copy of his WASC certificate. No. 4. That he swore to an oath on how the result was lost. No. 5. That when evil men wanted to stop him from contesting as President, they blackmailed him of not having a WASC certificate. Even to the point that the Military denied not being in possession of mandatory photocopies required by every institute before you join them. The then HIGHLY CORRUPT Military blamed the absence of the President’s certificate on poor record keeping in the sixties (shameless Military, thank God this is no more today). No 6. That as the conspiracy continued, the President (then Presidential Aspirant) officially requested from his alma mater (Provincial / Government Secondary School Katsina) to provide a spreadsheet of his WASC result. No 7. His alma mater obliged his request and publicly displayed his personal result and also issued him a new statement of result with the date of the issuance (I think January 20, 2015) on it. This was done to shame all the conspirators. No 8. That nobody challenged the authenticity of the spreadsheet/statement of result issued by GSS Katsina till date. NO ONE HAS TAKEN THE SCHOOL TO COURT FOR ISSUING A FAKE RESULT. No. 9. That the only media platform that took the part of professionalism on the issue was Sahara Reporters by carrying out an investigation (investigative journalism) on the issue. The Media Outfit requested from the Examination Body (Cambridge University) to confirm the authenticity of the statement of result and spreadsheet published by Buhari’s alma mater (Government Secondary School Katsina). No 10. That the Examination Body (Cambridge University.) DID NOT deny the authenticity of the spreadsheet as displayed by GSS Katsina. They admitted that PMB partook in WASC examination in the year (1961) he claimed but however FAILED TO CONFIRM SR request to publish same. THEY CITED EXTANT LAWS IN THE UK PROHIBITING PUBLICIZING PERSONAL RECORDS. No. 11. That anybody bringing up this issue again that PMB does not have WASC without first confirming from GSS Katsina and Cambridge University should be pitied as he has lost touch with time. No. 12. That the right question shouldn’t be the rationale for bringing 13 SANs or more but the eleven issues above. And all those SANs we learnt worked pro-bono. If I am not mistaken, Femi Falana also joined to use the judiciary in a democracy to fight all those evil schemers who don’t mean well for our nation.